The Cougar – Beautiful, Wild and Dangerous by author Paula Wild is a book I first came across over a year ago and was drawn to it partly due to its focus on cougars in western Canada. The author was born in the U.S. but moved to British Columbia (BC) where she currently resides, and where much of the book is focused. BC and in particular Vancouver Island, contains the largest concentration of cougars in Canada and in all of North America or the world, making the area a hot spot for cougar activity and encounters both positive and negative. The opening chapter includes the story of two young children who had fended off and survived a cougar attack on Vancouver Island in 1916 as well as insight into why the author decided to write the book. There are quite a few references to cougar attacks throughout, both historical and modern-day accounts, but the author mentions that her interest in writing about the cats wasn’t based on these experiences alone. Besides wanting to know how to prevent or survive an attack, she was also driven by a need to know more about an animal that is strongly linked to the same landscape she and many other people share. After hearing a cougar ‘scream’ near her home, listen to what that sounds like here, and reading an article about safety in cougar country she decided to delve into the world of this magnificent but highly misunderstood and persecuted big cat. For those not familiar with the history of cougars in Canada there is a decent introduction of what the cats met with when the first settlers arrived. The cats were declared ‘varmints’ a threat to livestock and people, they were to be destroyed at all costs, and by any means. Extermination campaigns and bounties were the norm, one cougar hunter was so successful that the Canadian government even provided hunting hounds for him. Many of these sanctioned bounties in Canada, as well as in the U.S., ended in the recent past when the bounty system was realized as an ineffective means of controlling the population and attitudes towards the cat started changing. By that point the numbers of cougars killed was staggering. In the book it is stated that during the bounty years an estimated “21,871 cougars were killed in BC alone“. The Cougar touches on a variety of topics including safety in cougar country, research, behavior, biology, the captive animal crisis and the rise of cougar encounters. Some researchers think that encounters are increasing due to the cats recovery in particular areas, while others feel that it is a direct result of the presence of more people and in cougar territory. Humans are simply putting more pressure on cougars, their prey and habitat which ultimately can have an impact on the cats behavior. All of this is a recipe for more conflict and to avoid it the public must educate themselves and wildlife agencies and government must be supportive. Unfortunately at the moment Canada continues to fall behind on almost all fronts when it comes to cougars – in research, education of the public and protection of the cats from persecution. Cougar attacks are still very rare – you are more likely to drown in your bathtub, be killed by a pet dog, or hit by lightning. Fear-mongering and sensationalism still exists, especially in the main stream media, and cougars are for the most part portrayed as a public threat, but thankfully some of the old attitudes towards cougars are slowly changing, with the knowledge that they already do co-exist with people remaining out of sight, preferring to avoid humans when they can. Researchers are now also aware of the vital and important role they play in healthy ecosystems, managing prey species and enriching our landscapes. The trade off with living in or near cougar country means we must take responsibility and learn to safely coexist with them taking precautions to ensure people, pets, children and livestock are safe. The Cougar – Beautiful, Wild and Dangerous addresses many of the key issues surrounding cougars as well as being an interesting read, especially for those who would like to know more about cougars in western Canada where they exist in what could be considered their last great refuge. First published by Penguin Books South Africa in 2012, My Life With Leopards – Graham Cooke’s Story, by Fransje van Riel was a much anticipated read for me, and as soon as it became available online I ordered it, I must admit it sat on my shelf for a while before I could get to it…practically screaming at me to pick it up. What drew me to this book initially, other than the obvious, is that other than Joy Adamson’s Queen of Shaba – The Story of an African Leopard, I am not aware of many other instances where a wild Leopard cub has been raised and released successfully back into the wild. The story begins in the private Game Reserve of Londolozi, South Africa May 1993 where 22 year old game ranger Graham Cooke is assigned to take care of two 6 week old leopard cubs who had been born into captivity in Zimbabwe. While the means by which the cubs were secured may not be ideal, this soon becomes unimportant as you read this very personal, passionate and beautiful story. The cubs, one male (Boycat) and one female (Poepface) are entrusted to Graham to be rehabilitated back to the wild once old enough to fend for themselves. Together they embark on a unique and very special journey and for Graham it would be one that changes him forever. Graham took his responsibility of caring for the two cubs very seriously, and without a doubt loved and cherished their lives and the time they had together. He demonstrates an extreme amount of patience, understanding, respect and kindness towards these amazing and would be potentially dangerous predators never forgetting that his ultimate goal is to ensure they stay wild enough to one day return to the wild. Grahams work with the cubs is not easy at first but his perseverance and gentleness allows him entry into their world and slowly he learns to communicate with them understanding their needs and behaviors. Along the way he learns the cubs unique personalities, Boycat the more relaxed outgoing of the two and Poepface the more reserved, and you see the cubs trust in Graham develop in wonderful ways, in turn this bond opens up a world of experiences and insights on leopards for Graham. Finally the cubs are moved to Zambia’s South Luangwa Valley, the place where Graham makes final preparations to let his cubs go forever. My Life With Leopards is a great read, it is powerful story of a bond between human and animal and the trust they share. The story is filled with highs, lows, humor and “wow” moments, it will leave you with a unique perspective on an experience that only a few individuals have been blessed with. It is also a reminder that nature is amazing and at times very unforgiving, it truly chooses no favorites. I found myself turning the pages wanting to know what was coming next, and I admit at times getting choked up and teary eyed. Having been fortunate enough to have visited the South Luangwa Valley, many years after this story takes place, I wondered if any of the Leopards I saw there were the descendants of Grahams Poepface. My Life With Leopards Graham Cooke’s Story is on my Favorite Cat Themed books list and is available online from Amazon.com in traditional Paperback or for Kindle. If you love the big cats, Leopards and wildlife be sure to pick this book up. 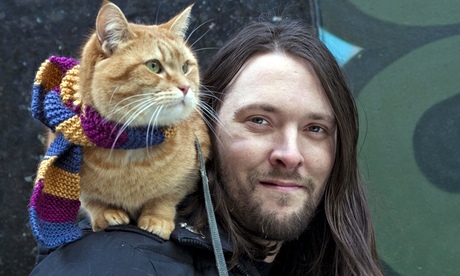 If you are a cat lover like myself, you may already know of the books A Street Cat Named Bob and sequel The World According To Bob. Both are based on the real life stories of how a serendipitous encounter changed the lives of street musician James and a stray cat named Bob. The famous duos presence on the streets of London would be the basis for an amazing and inspiring tale. Being a huge fan I jumped at the chance to review the newest addition, a prequel of sorts, called My Name is Bob which is geared for young children and is smartly told from the point of view of Bob the cat! The book introduces a whole new generation of readers to Bob and what his life was like before he met James. Bob is a house cat who is very much-loved and well cared for by his elderly owner, however a series of unfortunate events lead him to experience some unhappy times as a stray cat on the streets of London. Readers journey with Bob as he encounters people, other cats and the perils of the big city before finally meeting James. Once they meet their lives are changed, a beautiful and life long friendship ensues and the rest is history. My Name Is Bob makes a wonderful gift for any young child, it is fun to read, entertaining and well illustrated. It also includes some wonderful pictures of the real life Bob and James along with a synopsis of where the pair is at now. It is a story of hope and perseverance that will be sure to engage and inspire a young person. I also appreciate that the story brings awareness to the plight of stray cats by highlighting real life challenges they face on the street, making it a positive tool for teaching kids about compassion towards animals. 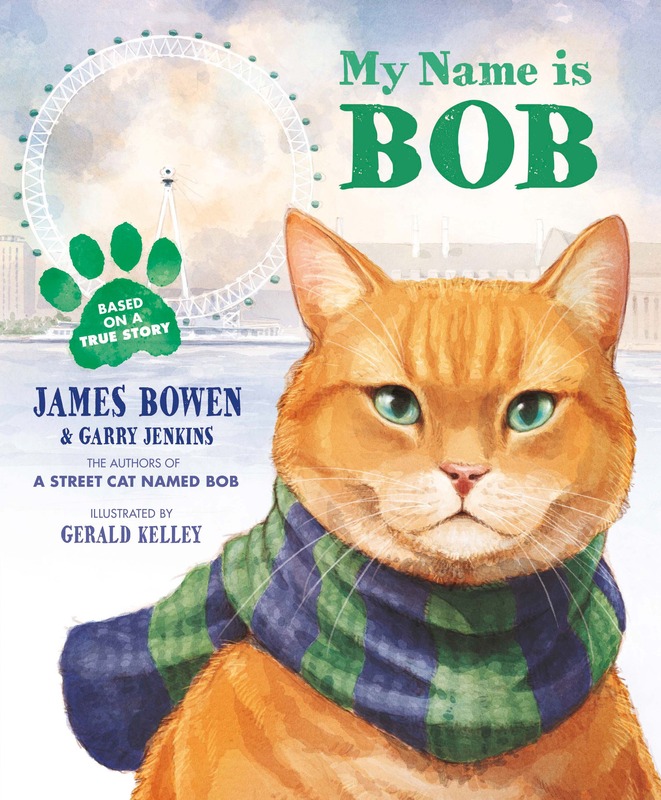 My Name Is Bob is a great introduction to the world of Bob and James and it will make a purrfect stepping stone for reading the other books later on. Release date is early May and can be purchased online from Barron’s Educational. It will also be available at most major and independent booksellers which include Barnes & Noble and Amazon.com in the US and retailers like Chapters Indigo, Amazon.ca, and Target here in Canada. Did you know In real life James and Bob raise money for the Blue Cross animal charity in the UK giving back to the organization that helped them?